Learn how to study. Sounds a bit like a contradiction right? The material should be the complicated part, not the studying part right? After starting college I quickly realized that was not the case. Here is my step by step guide so you can ace any college test thrown at you. Something I really began to learn in college, is that you can’t always use the same study methods for different subjects. Math and science areas are going to take a different sort of studying then humanities areas. Try to figure out your approach before hand. 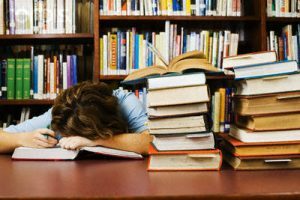 With the sheer amount of material given in short periods of time, it is key to start your studying early in college. I can’t begin to explain how many times I sat in the library thinking there isn’t nearly enough time for me to study. Start a study guide as you work through the weeks. Which leads me to my next tip. My best method for studying is to go back and reread all of my notes, and then write out the points I think are key. This way you are going through all the notes, and reviewing, while then having a study guide to continue to refer to. So the influx of words and information isn’t too overwhelming, I like to highlight the terms or concepts so I can easily recognize them, and then see the definition, steps or explanation.